The safest passwords are those that you do not know. Password masking follows this approach. It prevents the password from being shown, while allowing the use of the automatic sign-on. You can apply it via the button of the same name in the ribbon. The following option is required to apply password masking. In the same way as for the seal configuration, the authorize right for the record is required to apply or remove the masking. 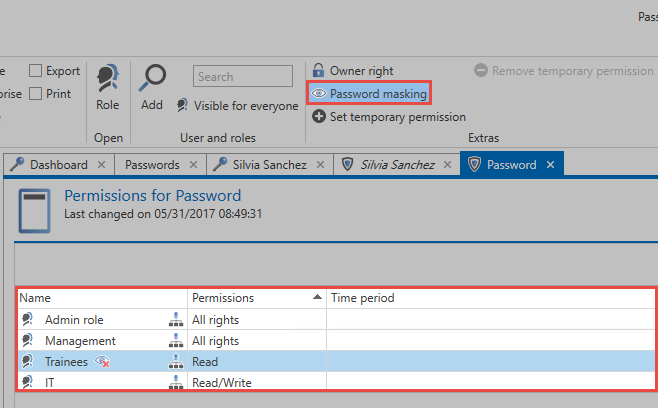 Users use have the authorize right for a record can continue to use the record without limitations after applying password masking. Password masking thus only applies to users without the stated right. *Password masking can only be applied to records with an existing password! The icon in the ribbon allows users with the required permissions to apply password masking following a confirmation prompt. By default, the privacy is for all those who have at least reading permission, but not the right * entitled *. As an alternative, you can also apply password masking via the form field permissions. In the detailed view of a record, there is a separate button in the ribbon for that purpose. Ensure that the password field is highlighted. The special feature when setting or editing masking via the form field permissions is that you can individually select users to whom masking will be applied. In the following example, masking has been specified only for the role of “trainees”, although the “IT” role does not have the Authorize right either. In addition to the name of the role or the user, the icon symbolizes the fact that visa protection applies to trainees. *Use the icon in the ribbon to apply password masking to all users who have read permission on the record, but not the Authorize right. 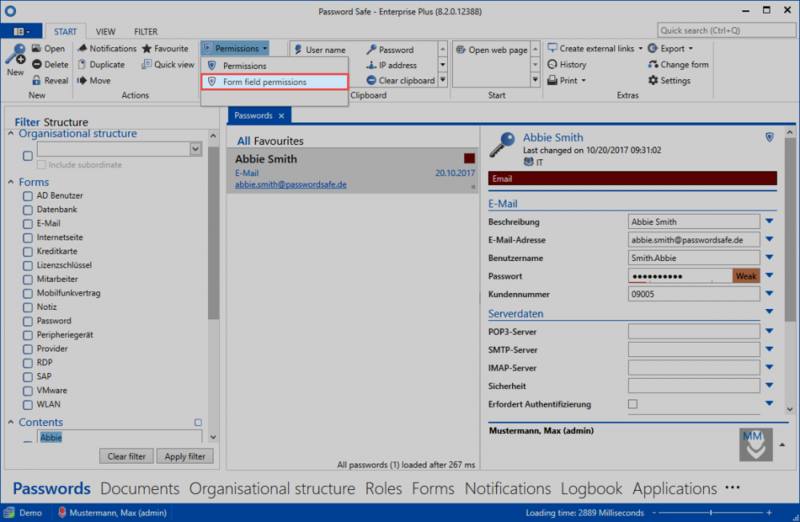 If you wish to specify more precisely for which users the password masking should be applied, this is also possible via the form field permissions. !The password masking only applies to those users who are authorized at the time of attachment to the record. If a record has the password masking and a user get´s authorized the record is not protected for this user. The password masking should then be removed and reset.